Let’s recap two reasons for a drinking fountain student design challenge. The obvious first reason is to obtain a drinking fountain near the Riley Park children’s playground and band stand. The second important reason is to create a stronger bond among Riley Park’s neighbours. Water for Riley is a collaborative, community building project. Drinking fountain designs were accepted from ACAD and SAIT students, and comments on the designs from Hillhurst School students and Hillhurst Sunnyside Community Association members. In the hundred+ years that those major Calgary institutions bordered Riley Park, they had never collaborated on a project – until now. When the Globe and Mail, (Alberta Edition) published an article about the few educational institutions where “a community connection is built right into the curriculum” we were pleased to be a community-based connection built into ACAD and SAIT curricula. The Globe and Mail wrote about this exciting new way that students learn about design, and how they apply that design to making life better for others, and the experience they gain from working in the community with real life clients. As we read it, we thought, hey, Calgary does that too. Way to go ACAD and SAIT. 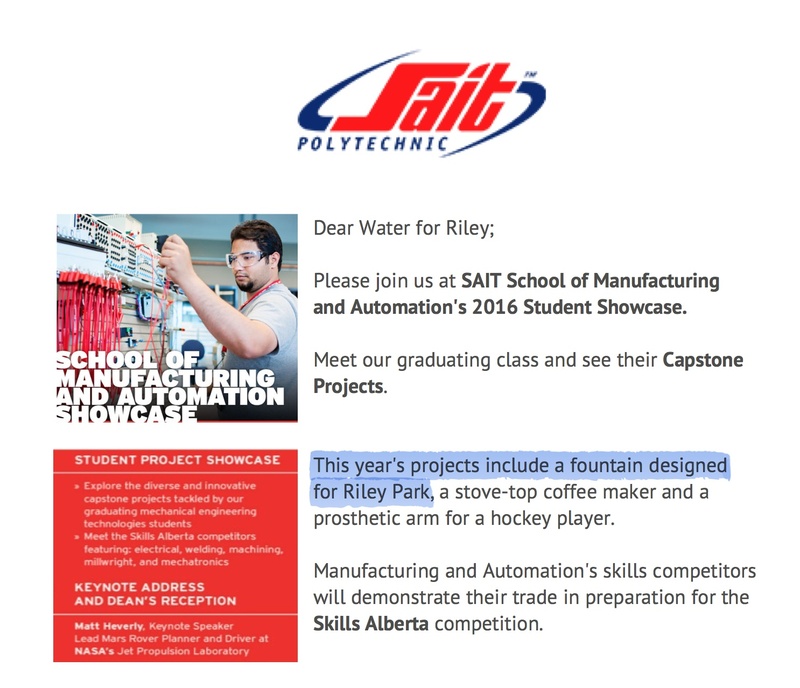 Water for Riley is your proud collaborator, especially during SAIT’s centenary year. To participate in Water for Riley activities, email, or call 403 862 1923. Donations made through the Parks Foundation; specify your donation is for Water for Riley. McMaster engineering students take on real-world assignments – helping residents of a seniors’ centre – and learn some life lessons. Yet, that is precisely one of the pedestrian issues that preoccupied hundreds of first-years in an engineering class at McMaster University in Hamilton. Their job seemed simple but, as they learned over the course of the term, it was as difficult as any larger project: to make life easier for the residents of a nursing home in the city. “We sketched three different designs but they did not work, or they were too complicated,” said Zain ul-Abadin, one of the students in the class. After much trial and error, the group designed a mechanism that does not rely on the strength of aging hands, reversing the usual mechanism and pushing the apple into the blade. “We tried it many, many times,” Mr. ul-Abadin said. An increasing number of university programs offer experiential courses, but what makes McMaster’s unusual is that a community connection is built right into the curriculum. Taught by Robert Fleisig, a professor who also works as an engineer, the course has previously taken on the problems of one individual. One year it was a burn victim with mobility issues, another year a senior with rheumatoid arthritis. For its fourth edition, the course ramped up and partnered with St. Peter’s Residence at Chedoke, a long-term care home. The approximately 200 residents at the home face multiple problems, from not having the muscle power to operate an apple cutter to wanting a door barrier that prevents other residents from wandering into their rooms but is unobtrusive. “We never picked one specific intervention we wanted the students to work on. If there was an opportunity for innovation and ideas, we wanted to be able to support that,” said Janine Mills, the director of resident care. Ms. Mills visited the class multiple times and allowed small groups of students to meet some of the residents. As the term progressed, there were many failures and disappointments. Some designs were rejected by residents during a first test run at the home. “The designs may work from a tech and biology perspective, but users have preferences you don’t know about,” said Monica Salib, who took the course four years ago and is now one of the teaching assistants. One resident, for example, rejected a barrier that would have to be placed in the room when not in use. “She said: ‘I don’t want anything in my room, my room already has a lot of stuff.’ So they had to think about storage,” Ms. Salib said. By the end of the term, the student teams had come up with many solutions, from a transparent half-door to one made out of cardboard that can be folded easily. The best eight teams presented their final designs at a Dragons’ Den event attended by professors from other departments, nursing home staff and students (the winning team came up with a foldable cane to help a resident get in and out of a car and walk to her wheelchair). And some teams could well see their ideas implemented at the home. Sandi Mugford is still using a hand-held portable gas pump designed by the 2013 students. As a result of rheumatoid arthritis, Ms. Mugford could no longer use a self-serve gas station. The students’ invention gave her back that independence. Since she received it, Ms. Mugford has retaped the pump a couple of times but the design was so ingeniously simple that “it’s nothing I can’t do,” she said. She remains impressed with how much the students learn over one term. “They’re engineering students; they’re not taking medicine, they have no prior knowledge of the human body except for their own. When you extrapolate that, that’s a huge learning curve,” Ms. Mugford said. Ms. Salib agrees. Taking the class in the first year prepared her for the teamwork expected in upper years and for life as an engineer, where big problems can be attacked only in small steps. “As a student, you want to solve everything, you want to feel that you accomplished the mission, but there is only one problem out of many that you can solve,” Ms. Salib said.